My Favourite childhood movies were Jungle Book, and few others (I don't remember the names). As a child, I didn't see that many movies. I preferred reading. I loved all the disney movies, but I absolutely loved the animated Japanese film My Neighbor Totoro. I still watch it over and over. It's a great film for both kids and adults, and so imaginative. The Goonies was a big favorite of mine. I even belonged to the Goonies fanclub. Other favorites were Labryinth and Xanadu, which isn't a kids movie, but I watched it over and over again. Pete's Dragon was my all-time favorite. That and Mary Poppins. But wow it's hard to choose. Chawww-co-lot! Huh-huh! My favorite line in The Goonies. Robin Hood and Star Wars! Sadly, twenty-some-odd years later, my tastes are basically the same. They may have broadened slightly, but in the scheme of things, they're the same. I hope that doesn't mean I've yet to grow up. Oh, my heck! I LOVE Ninja Turtles! My kids love it too! My hubby got the trilogy for me for Christmas and his brothers thought I got it for him. Nope. It's totally mine. ;) I loved Goonies too. And The Newsies. The Sandlot. And anything Disney. :) And I've seen that Tortoro movie. My sister and I loved it when we were little. Uh ... I went a little overboard. Great post! It's funny to see the movies the kids latch on to. When my son was three he watched Nacho Libre everyday and could pretty much quote the whole thing. As a kid I loved anything Disney. Also musicals. We were raised on them! Oh goodness. I used to watch "Babar" every day. Irecently rented it to show to the kid I nanny. It's scarier than I remember! We had to fast forward parts. But he loved it! In my house now, we watch most of the Pixar movies, but my kids love Jack Black so we watch Nacho Libre and School of Rock. They will watch anything with Jack Black. I loved the Goonies, my boys are 8 1/2 and 10 and when we put it on the hated it. It broke my heart! Oh well. Anything Transformers they love, and Star Wars. Yeah as a family I'd have to say Star Wars ranks it right up there. I loved Jungle Book and Mary Poppins too. Star Wars. No question. Not really a kid movie, but I couldn't get enough of it. It also came out the year I was born. It's all the Disney movies for me. I must've watched THE LION KING and THUMBELINA a million and a half times. 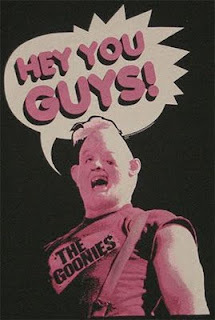 I love the goonies! Willow is another good one; Val Kilmer is rather attractive as well. My favourite movie was a toss up between Lion King and Fantasia. I'm definitely looking forward to the release of Lion King 3D in theaters! ooohhh..good one! I loved Girl's Just Wanna Have Fun! Twas my motto. Peter Pan and Star Wars. I also do recall watching Barbie as Rapunzel a few too many times. Mostly though, it was those old Justice League, Batman, Spiderman and X-Men cartoons. On a constant loop in my house. Aladdin was my favorite! I also liked Swan Princess. The first song is just too cute. Saw your entry for the Cover Contest - great design! Like your blog a lot too. I was always a big fan of The Princess Bride growing up. Pirates, adventure, ROUS...what's not to love? Oh my goodness, the Goonies! I used to love that movie. I loved the adventure and the danger and discovery. It's been a LONG while since I've seen it now though. My favorites were Labyrinth and Legend. Legend, incidentally, starred a very young Tom Cruise. I watched it as an adult and was shocked how scary it was. It has this devil guy in it who is half goat and he's really awful. I don't think I would let my kids watch it, to be honest! LOL! Tough call. I think my favorite wasn't a movie, but "Speed Racer" on TV. I didn't see many movies as a child. I liked the "Mickey Mouse Club" shows--the original ones, "Zoom," "The Electric Company," which has seen a revival--good shows!, and "Sesame Street" and "Mr. Rogers." I remember seeing "Herbie," "Mary Poppins" and "Star Wars." My sons really liked the "Land Before Time" series of movies--watched those over and over and over. The whole family loves "Ice Age" movies. Hope this helps! I grew up during the golden age of Disney animation, so all of those ones - Aladdin, The Jungle Book, Cinderella, Beauty and the Beast, Pocahontas. The Lion King was the first movie I ever saw in theaters.